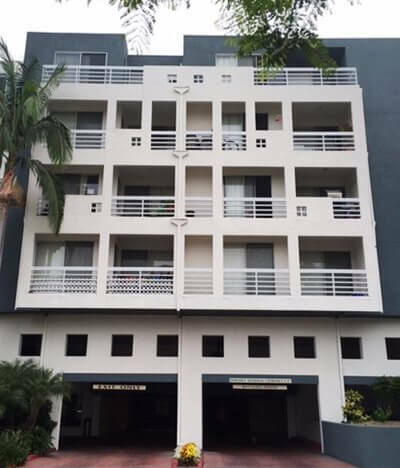 Tuff Kote Systems provides expert deck coating and waterproofing services to Orange County and the greater Los Angeles region. 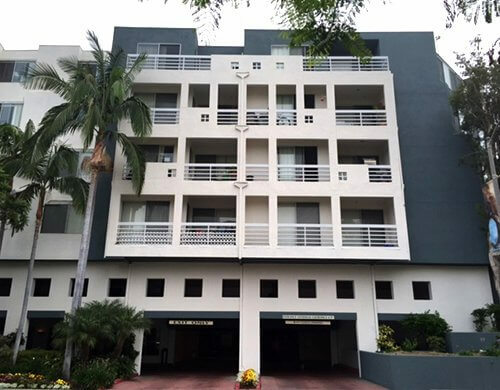 We offer our services at very competitive rates, and are committed to providing our valued Anaheim residential and commercial clients with exceptional customer service. 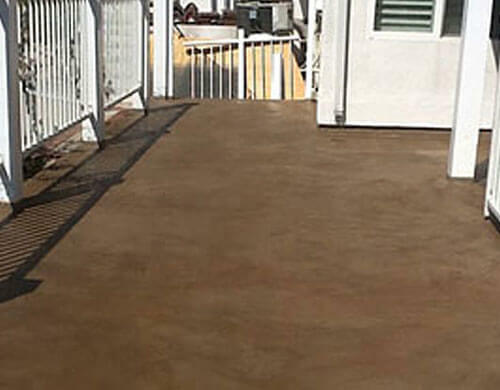 We have over 25 years of experience in the deck coating and waterproofing industry, and during this time, have provided our services to 1000's of satisfied clients throughout both Orange County and the greater Los Angeles region, including homeowners, condominium and apartment complexes, mobile home communities, commercial complexes, industrial facilities, motels and hotels, and theme parks. Our extensive list of clients includes the Los Angeles World Trade Center, Los Angeles International Airport, the Lafayette Building, the Sierra Towers, the L.A. Lofts, Disneyland, Knott's Berry Farm, and Universal Studios. Contact the deck coating and waterproofing experts at Tuff Kote Systems today. 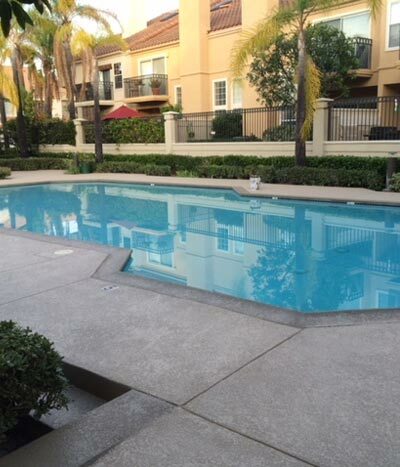 We install our durable, premium quality coating and waterproofing systems for Anaheim home and business owners at very competitive prices, and stand behind these systems with excellent warranties. We provide estimates to all of Orange County and the greater Los Angeles area, and accept Visa, Mastercard, American Express, and checks. Tuff Kote Systems is licensed, bonded, and insured. Deck coatings provide the ideal method of protecting such structures as wood and concrete decks, balconies, and elevated walkways. Today's deck coatings are extremely durable, and not only do they provide a waterproof layer that seals these porous surfaces against damage from water, soiling, and staining, they are available in an extensive array of colors, designs, and textures, and can turn your Anaheim home or commercial facility's deck into a striking architectural accent. There really is no limit to the range of looks that can be achieved using deck coatings. Your deck can be finished to have the look of flagstone, slate, cobblestone, marble, granite, or other stone types. It can be overlayed with a brick or tile pattern set on the diagonal or in a herringbone design. In addition, we can even "micro-top" the surface of your existing deck coating to change its color, giving your deck a whole new look. At Tuff Kote, we can install beautiful decorative finishes in a limitless variety of colors, patterns, and textures for Anaheim homes and businesses. We offer a smooth finish in an extensive selection of designs, as well as textured finishes such as knockdown and orange peel. And through the use of stencils and patterns, we can achieve the latest decorative faux finish looks, including faux stone designs such as slate, cobblestone, and flagstone, and also faux tile looks. Our durable decorative finishes are mold, mildew, and stain resistant, making them very easy to maintain. They are formulated to be stronger than conventional concrete, and due to this characteristic, add to the durability and structural integrity of the decks, balconies, stairways, walkways, and other surfaces where they are installed. In addition, they also provide added safety to these surfaces: They possess a Class A fire rating, and they are also slip resistant, and as such, will protect your family, employees, patrons, and guests from slips and falls. Moreover, they are also heat resistant, and will keep the outdoor surfaces they beautify comfortable to the touch in hot, sunny weather. Recoat, reseal, and waterproof Anaheim decks. Replace damaged drywall and insulation beneath decks built over roofs. Call us today in Anaheim. 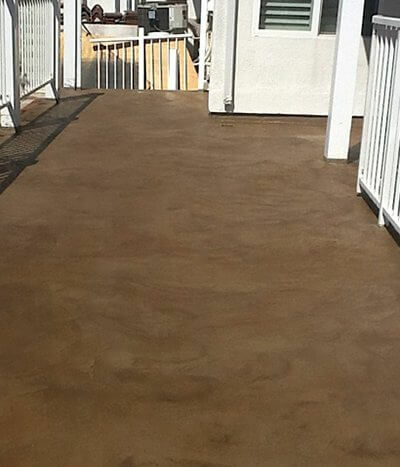 Concrete staining is a colorful way of adding design interest to interior and exterior concrete surfaces in Anaheim. 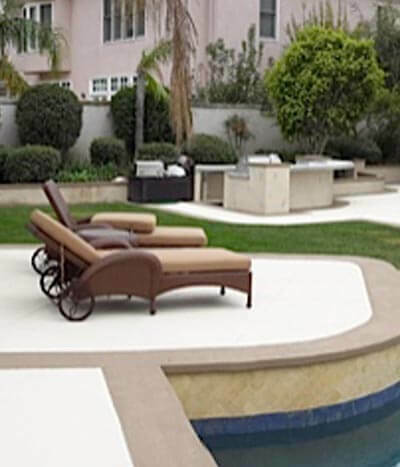 Through the use of concrete stains and dyes, interior and exterior floors, pool decks, driveways, patios, walkways and other concrete hardscape surfaces can be transformed into unique design features which are both durable and functional. And through the use of different application techniques, a limitless variety of design effects can be achieved, including multi-tonal and mosaic patterns which will provide a stunning accent to your home or business's interior decor or outdoor landscape design. At Tuff Kote Systems, we install Title 24 compliant roof coatings for Anaheim California. California's Title 24 Energy Efficiency Standards set forth specific requirements for nonresidential roofing systems. According to Title 24 specifications, roof coatings must conform to a certain level of solar reflectance and thermal emittance standards. At Tuff Kote Systems, the durable, premium quality roof coatings we install for Anaheim businesses and industrial facilities meet these standards. In addition, because they comply with these regulations, they save our valued clients significantly on their cooling bills, because of their superior insulating properties. 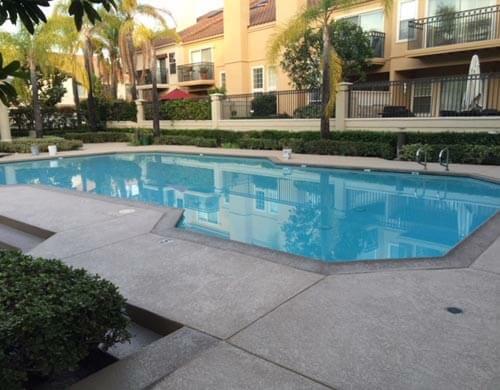 Depend upon the waterproofing experts at Tuff Kote Systems to diagnose and resolve any above or below grade water leakage or seepage problems you may be experiencing at your Anaheim residential or commercial property. High water tables and surface water can both contribute to below grade moisture problems in residential and commercial structures. And these conditions are all too often compounded by a poorly graded or sloping landscape surrounding the structure, containing a poorly functioning ground level drainage system, and in addition, an inadequate rain gutter system. Proper below-grade design begins with the diversion of surface and groundwater away from the structure, as below-grade envelope components should not be subjected to excessive amounts of moisture whenever possible. This is due to the fact that adverse moisture conditions below grade can cause significant damage to a building's structural components, resulting in concrete spalling, reinforcing steel corrosion, and the formation of cracks in the building due to structural settlement. 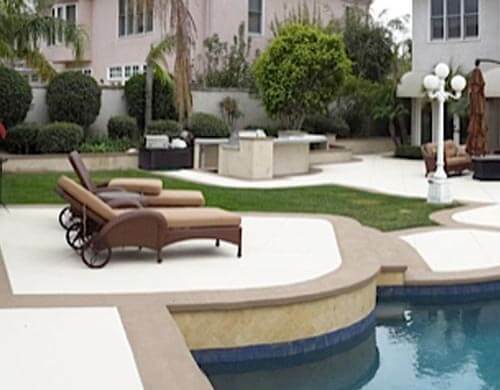 Contact the deck coating and waterproofing experts at Tuff Kote Systems today, Anaheim. We provide estimates, and accept Visa, Mastercard, American Express, and checks. Tuff Kote Systems is licensed, bonded, and insured.